Currently, Cabelas.com regularly offers free shipping promotions, and Amazon.com offers free shipping on major orders totalling $25.00 or more. The adoption by L.L. Bean of an “All free shipping, all the time” is expected to put pressure on other catalogers to follow suit. This may be a good thing for shooters, whose products may be heavier, on average, than the typical consumer purchasing clothing, or travel accessories. Share the post "L.L. 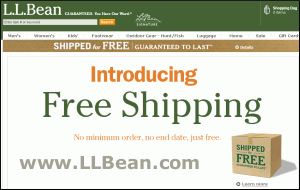 Bean Adopts Year-Round Free Shipping Policy"